I know. This is a cat rescue site, so what is an iguana doing here? Well, if your pet iguana gets loose and climbs a tree what are you going to do? 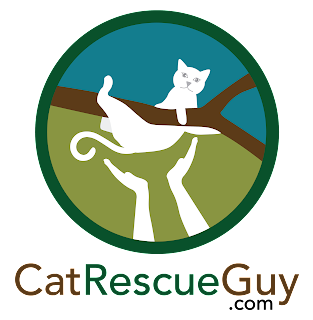 If you think finding a tree-climbing cat rescuer is difficult, try finding an iguana rescuer. I admit I was very hesitant to agree to give this a try when I first got the call. I know absolutely nothing about iguanas, but these people really cared about their pet. The owner had already tried to rescue the iguana with a home-made catch pole while standing on a ladder on the roof of the house resulting in a fall for both. 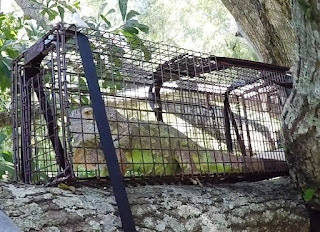 Fortunately, no one was harmed in the process, but the iguana ran to another tree and found safety in its branches. I had to at least take a look to see if I could do anything. I went out to the site and was told that the iguana was in this very large tree with numerous very long branches. My heart sank as I thought of how difficult it would be to get close to an iguana in this tree. Iguanas are adapted to life in a tree; people are not. There were so many places for the iguana to go, and she could go to places I could never get to. And, indeed, we could not find her. We scanned that tree for an hour with and without binoculars looking for her but could not find her. I did not want to climb the tree unless I had at least an approximate location because there was too much tree to explore. I could be up there all day looking for her. So, I left and told them to call me when they locate her. The next day they called and said they had located her in the tree and would watch her until I could get there. So I went back out and they pointed her out to me. Even with explicit instructions on where to look and with precise finger pointing, I still had difficulty finding her. All I could see was a small piece of a foot, and later I saw her head, but I never got a complete look at her. She would watch our every move and adjust her position to stay out of our sight at all times. This would be 100 times worse than the most uncooperative cat I had ever tried to rescue. I had to re-think this. In the tree, the iguana has all the advantages. She can, and will, go out to the extreme ends of these long branches where I would never be able to go. She can even hang upside down on the bottoms of the branches. I thought that any attempt to get close to her would be futile unless I got very lucky, and I don't like to rely on luck. 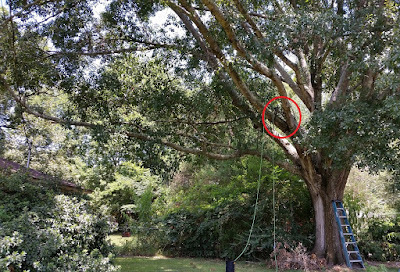 So I suggested that I set a cat trap in the tree on the branch she was on and then leave. They had already successfully fed her in the tree by using a ladder to place the food up in the tree and letting her find it. If she returned to the same place to feed again, she would have to pass through the trap and discover her food in there instead. They loved the idea, so I strapped the trap on her branch where I circled in red in the picture above, set her food in it, and we all left her alone. I expected to get a call early the next morning, but it didn't come. I figured the iguana would look for food during the night after everything got quiet and she felt safe enough. As the morning went on with no call, I was getting worried. At 11:30 the phone rang and they told me that she had just gone into the trap and triggered the trap door. She was trapped and safe. We got her! I went out there to bring her down. The video shows her retrieval, but there is no video of her prior to that because I never saw her prior to that. This is when I really saw her for the first time. So, meet Dino (pronounced Dean-o), an iguana who suffered an abusive childhood before finding love and care in the home of her present owner. Here she is at the undignified end of her wild adventure turning green with fear. She is safe at home now and is doing well.